ACAAI’s Continuing Medical Education program is designed to support our members and other healthcare providers in attaining our mission to advance the science and practice of allergy, asthma and immunology and related conditions. Our high quality, evidence-based program integrates professional practice management and Maintenance of Certification activities with CME to improve competence and performance in allergy and immunology. In November 2017, the American College of Allergy, Asthma and Immunology went through the reaccreditation process with the Accreditation Council for Continuing Medical Education (ACCME). 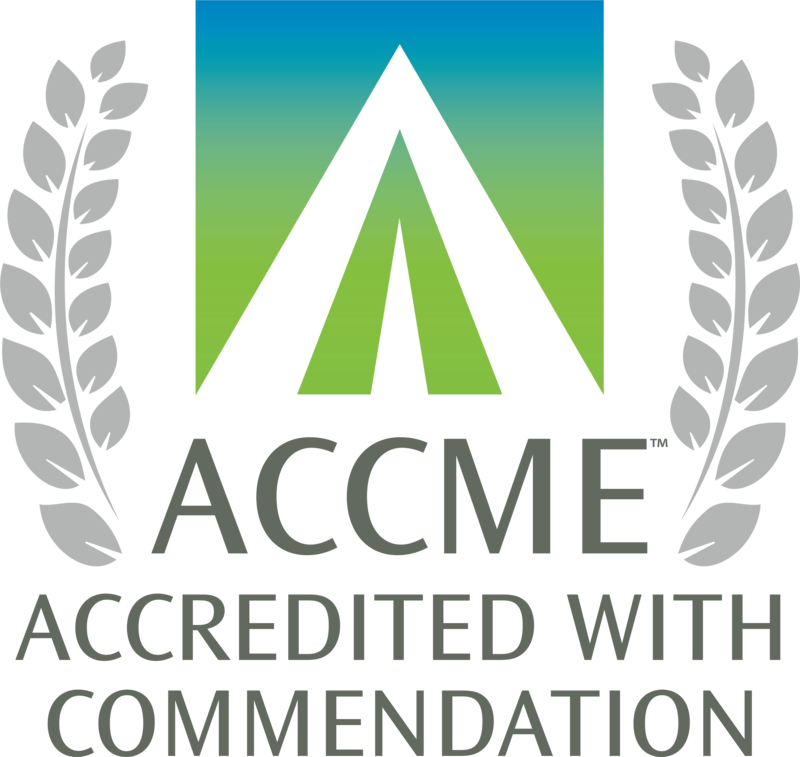 We are proud to announce that ACAAI was awarded Accreditation with Commendation, the highest accreditation status available in the ACCME system. ACAAI is accredited to provide continuing medical education for physicians through November 30, 2023. The accreditation process is ongoing and all-encompassing, involving procedures relating to every aspect of education, including the Annual Scientific Meeting, Annals of Allergy, Asthma & Immunology, enduring materials, and online courses. The College's Education programs are overseen by the Education Council, lead by Dana Wallace, MD, and composed of the Chairperson from each of the following education committees. The role of the Education Council is to formulate and oversee implementation of the Education Strategic Plan and Curriculum; to provide leadership and direction to the Education Committees on all aspects of ACAAI Education programs; and to ensure the development of new education leadership. Accreditation & Certification: Role - Working with staff, provide expertise and oversight to ensure the maintenance of ACCME Accreditation. Ensure the College’s MOC programming meets the needs of membership. Represent the College and its interests in national forums on matters of accreditation and certification (ACCME, ABMS, AMA, SACME, ACEHP, FMSB, CMSS, ABAI etc). Allied Health: Role - The charge of this committee is to plan both the Advanced Practice and Allied Health programs for the annual meeting. The committee also provides guidance on educational matters for their constituency. Annual Meeting Program: Role - Plan, implement and evaluate the educational content of the Annual Scientific Meeting. Drive the continual development of the College’s premier educational event as increasingly relevant, innovative, and a not-to-be-missed educational experience. Ensure quality educational opportunities that are inclusive of the latest evidence-based information, best practices and networked learning in the specialty. Work with other members of the Education Council to support the identified educational needs of the specialty. Clinical Programs, Patient Safety & Quality: Role - Develop educational content in clinical areas, patient safety and quality. Education Services, Data and Technology: Role – Ensure the College’s information strategy and platforms support and inform the College’s educational and research goals. Program Directors, GME: Role – Leverage College programming and services to support the needs of training programs and fellows and strengthen the relationship between training programs, trainees and the College. Advise the College on the emergent needs of new practitioner/young physicians. Support the College efforts to expand outreach to residents. As required by the Accreditation Council for Continuing Medical Education (ACCME) and in accordance with the American College of Allergy, Asthma and Immunology (ACAAI) policy, all educational planners, presenters, instructors, moderators, authors, reviewers, and other individuals in a position to control or influence the content of an activity must disclose all relevant financial relationships with any commercial interest that have occurred within the past 12 months. The ACCME defines a “commercial interest” as any entity producing, marketing, re-selling, or distributing health care goods or services, used on, or consumed by, patients. The ACCME does not consider providers of clinical service directly to patients to be commercial interests. For more information, visit www.accme.org. All identified conflicts of interest must be resolved and the educational content thoroughly vetted for fair balance, scientific objectivity, and appropriateness of patient care recommendations. It is required that disclosure be provided to the learners prior to the start of the activity. Individuals with no relevant financial relationships must also inform the learners that no relevant financial relationships exist. Learners must also be informed when off-label, experimental/investigational uses of drugs or devices are discussed in an educational activity or included in related materials. Disclosure in no way implies that the information presented is biased or of lesser quality. It is incumbent upon course participants to be aware of these factors in interpreting the program contents and evaluating recommendations.